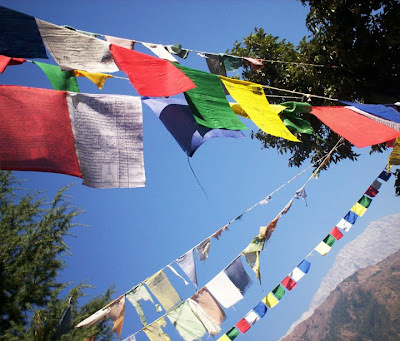 Pieces of cloth strung together, flutter in the winds and take your prayers to the sky. 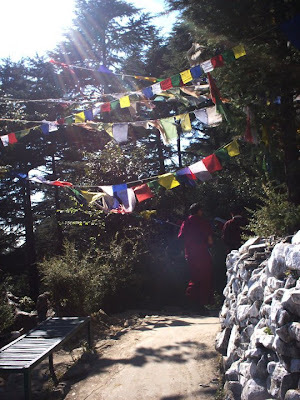 Prayer flags are part of the landscape and omnipresent in the Indian mountainous landscape. 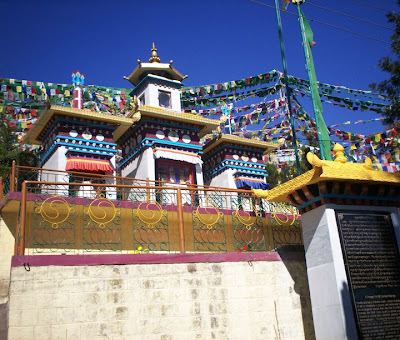 Tibetan in origin, they are unmissable when you go to Mcleod Gunj. 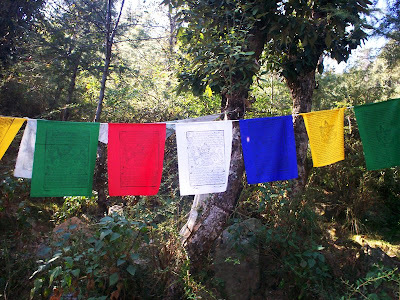 All the following pictures are part of that trip & on every trek to a gompa/temple/monastry, these flags led the way. and sometimes a multitude of them, rise in a chorus, taking your prayers with them. 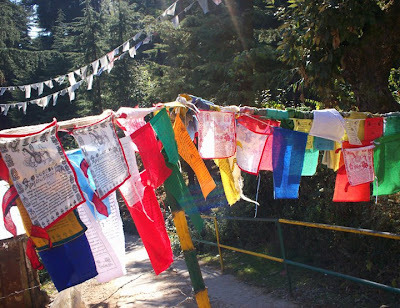 Prayer flags are readily available at any of the stores in Mcleod Gunj and they come in many types and forms. 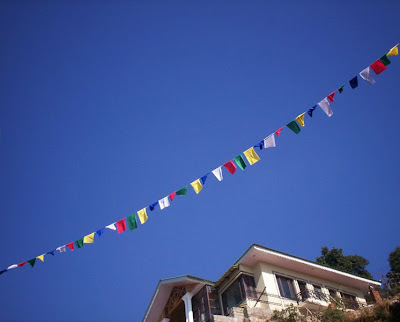 The set of flags on the left are the King Gesar flags and they promise peace, harmony and enlightenment. 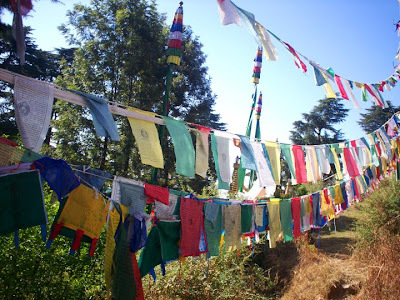 The set of flags on the right are a popular mix of the Large Wind Horse, The Victorious Banner, Praise to the 21 taras, Sampa Lhundrup and the Gyaltsen Semo. These are just words to me as much as they are to you & you can read more about them in detail here. 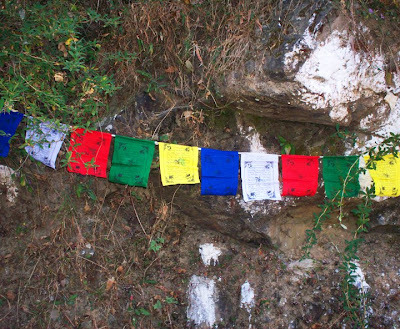 The Kurukulle Flag: This traditional prayer flag is used for increasing one's power and control over the phenomenal world through the the power of Kurukulle, the wrathful standing red Tara. Her 4 arms hold a hook, a lasso, a bow and arrow (all made of flowers) with which she subdues all obstacles. She treads on a figure representing duality and egotism. 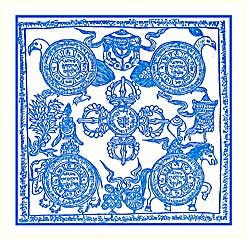 In the corners of the flag are animals symbolizing the powers of the four directions. The text has a prayer to Kurukulle and slokas for the 4 Dignities. The purpose of this flag is to suppress negative energy and enemies, to overcome obstacles and to increase health, wealth, and longevity. 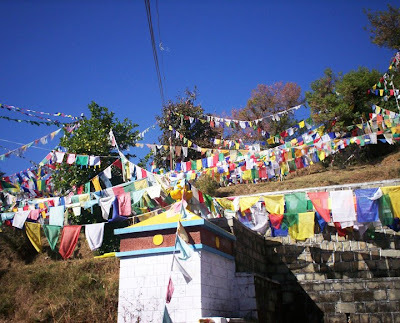 The Mig thong Prayer flag on the right is to ward off evil or jealous eyes and in normally hung outside homes & the flag returns the negativity back to the initiator -not in a destructive way but in a kind, pacifying way. 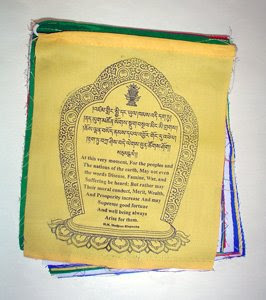 The Vast luck Flag: This is a traditional Tibetan prayer flag with a double dorje in the center where it is written "May the holder of this charm be given the gift of eternal life." 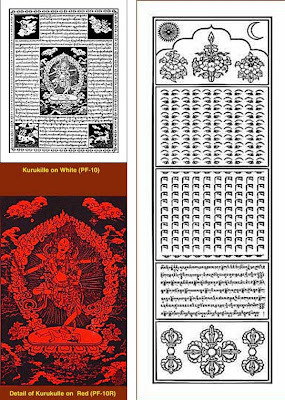 In the corners are the garuda, the peacock, the elephant, and the wind horse with mantras to protect and increase life, health, wealth and good fortune. The Eight Auspicious Symbols are depicted between the lotus mantra discs. Around the edge are inscribed protection and increasing prayers. 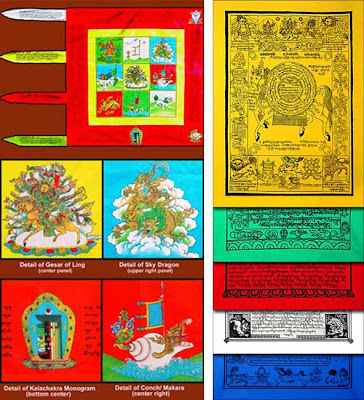 Gyaltsen Semo: This exquisitely drawn traditional Tibetan Prayer flag portrays the "Four Dignities" in the corners. 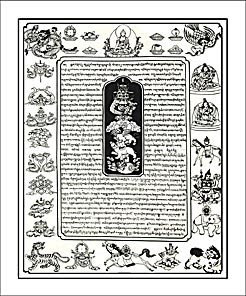 On the left side are the Eight Auspicious Symbols and down the right side are the eight precious possessions of a Monarch (minister, queen, wish fulfilling jewel, vase, horse, general, golden wheel elephant). At the bottom of the banner is the Wind Horse of good fortune among the five sensuous offerings. At the top center sits Sakyamuni Buddha in subduing pose surrounded by the eight glorious offerings. 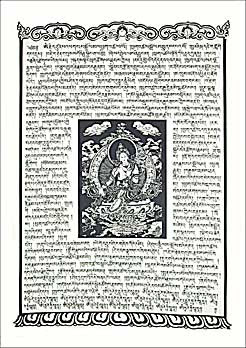 Praise to the 21 Taras: The Tibetan script on this traditional flag praises Tara in all her manifestations. The verses conclude with her root mantra "OM TARE TU TARE TURE SOHA," the magical syllables that evoke the goddess. 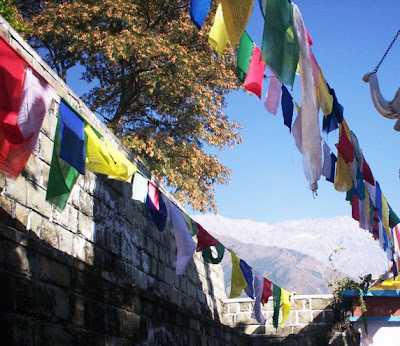 And I love this picture where row upon row of prayer flags, line up and form a perfect backdrop to this temple. Dar Dhiafa, a small hotel in Djerba, Tunisia. News you can use - Wood World, Maram.